This easy Pasta Carbonara comes together in about 30 minutes and is the perfect weeknight dinner! 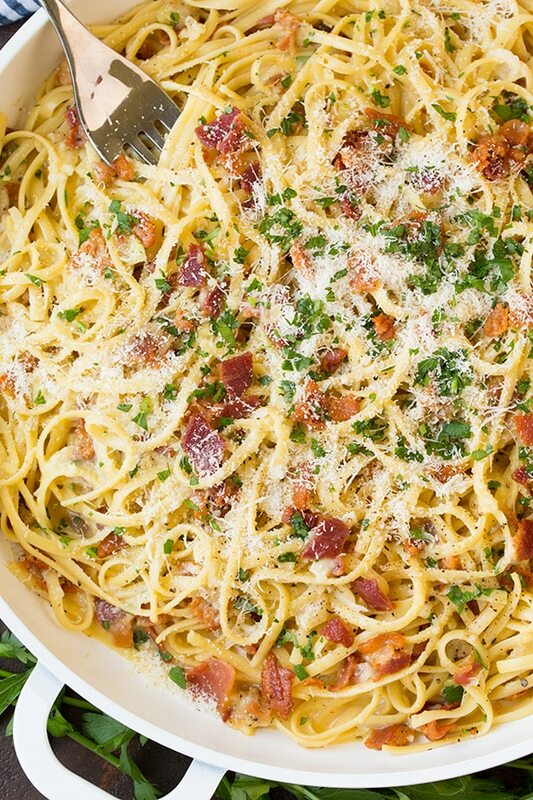 Packed with crispy bacon and mixed with the creamiest carbonara sauce, this recipe is a total knockout. Pasta carbonara is one of those simple dinners we should all know how to make. 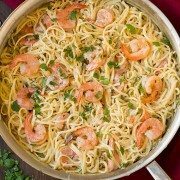 It’s the perfect go-to for a busy weeknight, and it’s also a dish fit for the weekend or even to serve to guests. It seems like one of those dinners with so few ingredients that how could you possibly mess it up, but oh how you can if you aren’t using with the right method. I’m no expert on carbonara, which is why I turned to Cook’s Illustrated, they are the kitchen geniuses. I loved how they cooked their pasta in less water to begin with to really concentrate the starches, which will help bind everything in the sauce and prevent separation when you add it to the egg mixture. I also loved that they simmered the bacon in water first — I always feel like my bacon burns or unevenly cooks for some reason when I cook it in a skillet, but when I went their route and cooked it in water first and let it simmer off and then continued to brown, it worked like a charm. I had perfectly browned and crisp bacon. I also loved that they tested and came up with the perfect ratio of eggs and yolks (or one yolk in this case) to have the perfect custard flavor and the perfect consistency. 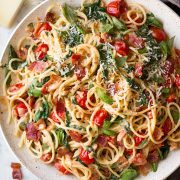 Their recipe listed Romano cheese, but I always have Parmesan on hand so I went with that to keep the simple weeknight meal idea here, but I’m sure Romano would also be delicious. Better yet, use half of each. Just be sure it’s freshly grated. Enjoy! 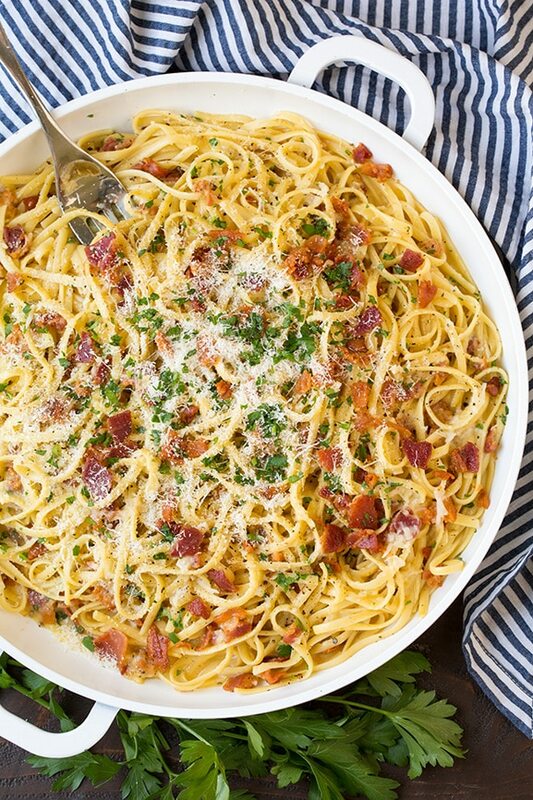 If you’ve never had homemade pasta carbonara before, you’re in for a real treat! 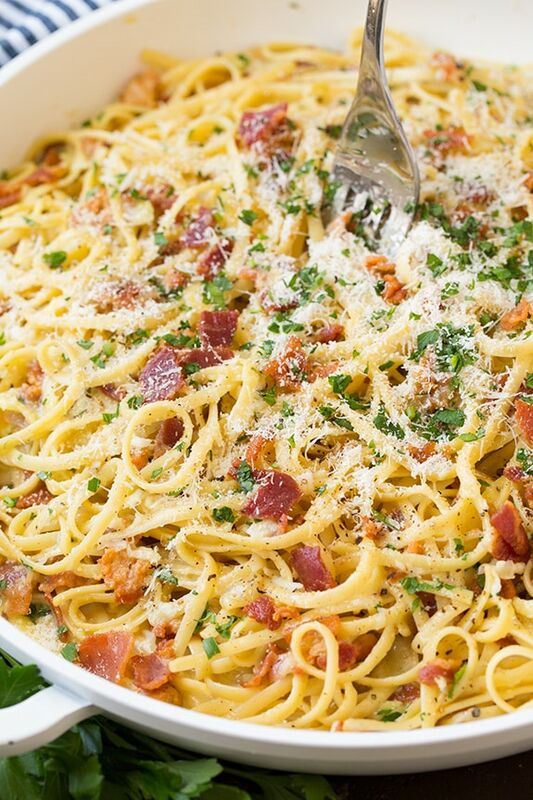 Pasta carbonara typically features a creamy sauce that’s made with pancetta, garlic, heavy cream, cheese and eggs. The egg-based sauce is cooked by combining it with the piping hot pasta and a little of the cooking water. 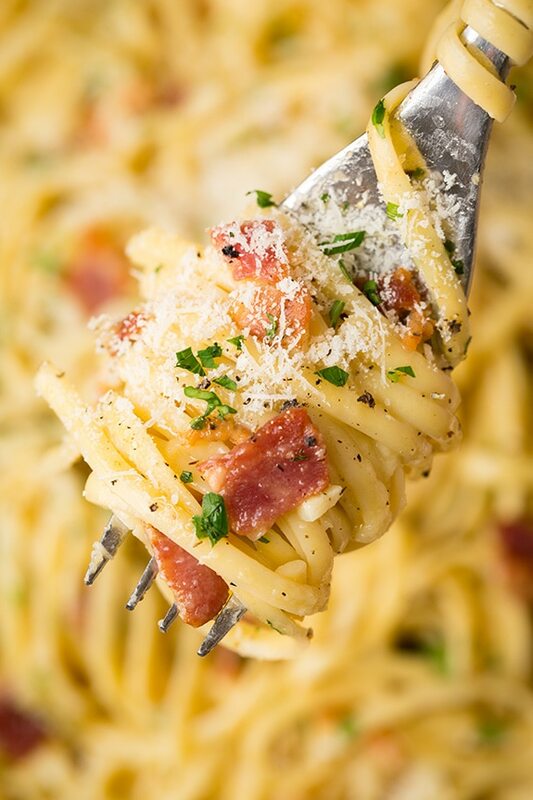 For this easy carbonara recipe, I used bacon instead of pancetta since that’s easier to find where I live. 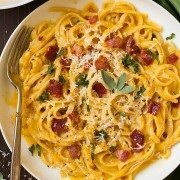 But otherwise this is a pretty authentic carbonara recipe! Add bacon and water to a skillet and bring to a simmer. Continue simmering until water is evaporated, then continue to cook the bacon until crispy. Remove bacon from pan and reserve the drippings. Saute garlic in that same skillet until golden brown, then add to a bowl with 1 tablespoon bacon fat, eggs, egg yolk, Parmesan and pepper. Mix well. Meanwhile, cook the pasta until al dente. Once cooked, drain pasta and reserve 1 cup of the cooking water. Slowly pour the hot cooking water into the egg mixture. Then pour over the hot pasta and toss to coat. Add crumbled bacon. Let pasta rest for a few minutes, tossing frequently until the carbonara sauce thickens. Serve immediately with a sprinkle of fresh parsley. Is it Safe to Eat Raw Eggs in Carbonara Sauce? The eggs are totally safe to eat in this pasta carbonara. They have plenty of time to cook since they’re tossed with both the cooking water and the hot pasta. So the “raw” eggs aren’t actually raw by the time you serve this dish! Can I Use Another Type of Cheese in the Sauce? Yes, any hard Italian cheese should work well in this sauce. Romano cheese would taste delicious in this recipe, as would a blend of cheeses. Does This Pasta Reheat Well? No, pasta carbonara is one of the Italian dishes that doesn’t reheat well. The creamy sauce thickens in the fridge and loses its silky texture. But don’t throw away leftovers, as they’ll still taste fine! Use freshly grated Parmesan, not the stuff in the shaker can. It’ll melt better and gives this dish a richer flavor. Be sure you immediately add the hot pasta water into the egg mixture to help cook it (if needed, you could even re-warm it in the microwave, but it needs to be very hot). 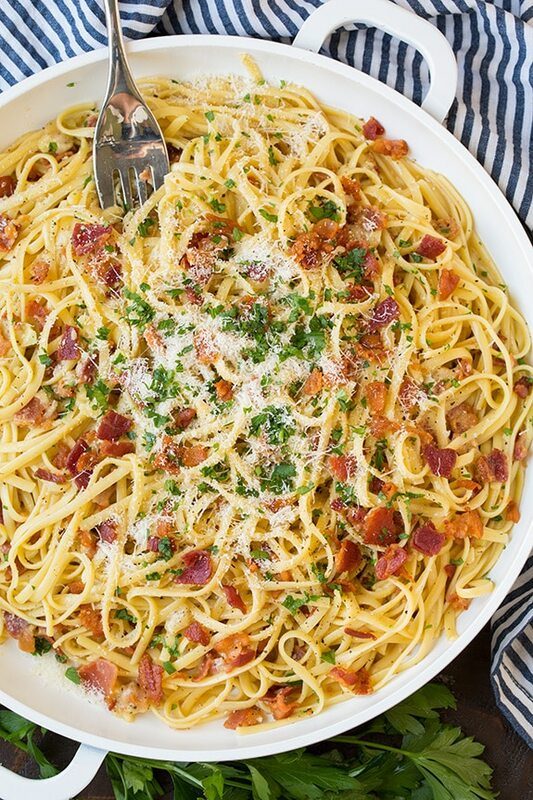 Pasta carbonara is best enjoyed immediately after you make it. This easy Pasta Carbonara comes together in about 30 minutes and is the perfect weeknight dinner. It's an Italian recipe the whole family will love! Add bacon and 1/2 cup of the water to a large non-stick skillet and bring to a simmer over medium-high heat. Allow to simmer until water evaporates about 6 - 7 minutes, then reduce heat to medium-low and continue to cook until bacon is brown and crisp, about 6 - 8 minutes longer. Place a fine mesh strainer over a bowl then pour bacon into strainer while reserving about 1 tsp of the rendered fat in pan. Return pan to heat and saute garlic about 30 seconds, until fragrant and lightly golden. Pour into a medium mixing bowl then add 1 Tbsp rendered bacon fat (drippings in bowl set under strainer) to mixing bowl with garlic. Add eggs, egg yolk, parmesan and pepper to garlic mixture and whisk until well combined.
. Drain al dente pasta into colander in bowl, while reserving pasta water in bowl. Measure out 1 cup hot pasta water and discard remaining water. Place pasta in now empty large bowl. Slowly pour and whisk 1/2 cup pasta water into egg mixture, then slowly pour mixture over pasta while tossing to coat. Add bacon and toss to combine. Season with salt if desired. Let pasta rest, tossing frequently, 2 - 4 minutes until sauce has thickened slightly and coats pasta. Thin with remaining 1/2 cup hot pasta water as needed. Serve immediately topped with additional parmesan and parsley. Use freshly grated Parmesan, not the stuff in the shaker can. It'll melt better and gives this dish a richer flavor.